I seek out a Padaung student to get her views. Beneletta, 17-years-old, is shy and attractive, with neat bangs and a Pepsodent smile. She wears a green sweatshirt and a faded sarong. “Yes, one or two girls in the village have neck rings,” she says. “And they’re still there – they’re too shy to leave. “When I was five or six some people in the community urged my parents to put the rings on me. My father refused; he didn’t want me to become a prisoner in the village. Although the Bishop’s stringent no neck-ring policy might disappoint culture trippers, it probably is the right thing for the youngsters in the tribe. Yet it smacks of a paternalism that one finds wherever someone in power sets the rules for those without power. While I lived in Asia I wondered why it was generally accepted that American Peace Corps volunteers, like me, were sent to Asia, but Asian countries never sent volunteers to help Americans? Why couldn’t Malaysian community development experts set up youth employment schemes in Los Angeles, or Iban community reforestation experts from Borneo help create town parks in Detroit? Yet in today’s Asia, brown-brown arrogance is much more prevalent. I sought out James Wong Kim Min for guidance. Dato James is concurrently the Sarawak State Minister of Tourism and Local Government and one of the state’s biggest timber tycoons, a combination that might befuddle a lesser man. Although pasty of complexion, he was bursting with energy. “What do you want to talk about? 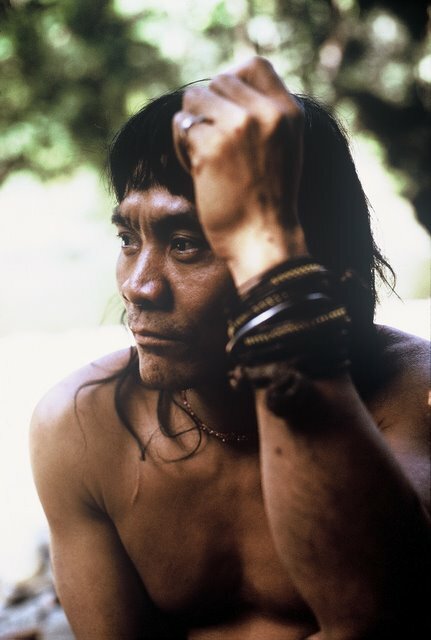 Penans?” he asked, referring to the controversial group of several thousand hunter-gatherers who live in the interior of the state. James Wong loves to talk with foreigners about the Penan, whom the foreign press has idealized as a group of innocent, down-trodden, blowpipe wielding, loinclothed people who are wise in the ways of the forest but hopelessly naive when faced with modern Malaysian politics. Well, sort of. The state suffers from massive deforestation and massive corruption at the highest level, which has had a severe impact on the social structure of the country. Nevertheless, leaving aside the downtrodden and dispirited Penan for the moment, Sarawak is, in many ways, a model society. People’s lives are improving. Education is important. Health services are common. It may be poor in spots, but in general Sarawak is one of the most harmonious places I’ve ever lived. You can walk anywhere safely, and see smiles and eat good food cheaply and buy whatever you need and … well, forgetting the forest destruction, corruption, vote-buying and related social and environmental dilemmas for a moment, it’s a pretty good corner of the world. I explained my experience with Penans who had been encouraged by generous government incentives to resettle into longhouses. How their natural environment had been hammered, how their faces were devoid of spirit and energy, how they had seemingly tumbled even further down the Sarawak social totem pole.